25% Off First Orders with Newsletter Sign-Ups at Tassimo Sign up to the Tassimo newsletter and stay in the know with all your favourite drinks, and get 10% off your order! £20 Coffee Credit on Machine Registration at Tassimo Register your coffee machine at Tassimo and get £20 credit for your next order. £10 Off Drinks Orders with Machine Registrations at Tassimo Simply log in or create an account, select and confirm your machine and then claim your free £10 coffee credit! £60 Off Selected Coffee Machines Plus 3 Packs Bundle at Tassimo Huge savings on selected coffee machines at Tassimo! Discover Coffee Machines from £99.99 at Tassimo Shop a great range of smart and compact coffee machines at Tassimo and start every day with your favourite coffee! Descaling Tablets from £5.99 at Tassimo Keep your machine in perfect working order with these brilliant tablets from Tassimo. 10% Off Orders with Newsletter Sign-ups at Tassimo Sign up to the Tassimo Newsletter for updates and offers and get 10% off your order! £63 Off Black VIVY Machine Plus 3 Packs at Tassimo Save over half price on the VIVY Machine and get 3 packs bundle included! Since 2004, Tassimo has been delivering cafe-quality drinks to your kitchen at the touch of a button. Using its own patented pods (T-Discs), Tassimo’s patented Intellibrew technology ensures excellence in every cup. By scanning the barcode on the T-Disc, the machine applies the correct volume and temperature of water and lets it brew for the optimum time, ensuring great results drink after drink. Its machines feature automatic cleaning and descaling programs, so maintenance is never a problem. The energy saving 'auto-off' feature means the machines switch to stand-by mode automatically after every brewing cycle, ensuring they are energy efficient. With fast-acting heating technology, your water will heat-up quickly, and the water tank can easily be removed for refill. The drinks range has something for everyone, and you can pick up some handy accessories to enhance your experience. The website even has a great recipes page that shows you how to use your delicious hot drinks as part of some gorgeous treats. Cappuccino Waffles, anyone? Tassimo’s offers page has some great deals on their top drinks and machines! What sort of warranty do Tassimo machines come with? Tassimo machines come with a 2 year warranty. How do I maintain my Tassimo machine? Check out Tassimo’s Youtube channel for cleaning and maintenance advice. What brands can I get for Tassimo? You can enjoy Costa, Carte Noire, Twinings, Kenco, Cadbury, Milka and Jacobs. Delivery is £3.99 unless you spend over £35, in which case it is free. Delivery usually occurs within 3 days of ordering if order is placed before 4pm. You can return unused and unopened products for any reason within 7 working days of receiving your delivery. If you would like to return your product, please contact customer support. 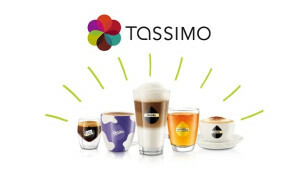 If you’re a hot drinks fan you’ll want to check out Tassimo’s range of machines and beverages. Now you can enjoy café quality coffee, tea and hot chocolate in your own kitchen with Tassimo’s no-fuss range. One of our Tassimo discount codes could save you money on your new machine, so you can enjoy great quality drinks for less. Slick and easy to use, Tassimo’s products are a great asset to your kitchen. How do I use my Tassimo discount codes? Tassimo’s products come with special T-Discs, which contain all the ingredients your machine needs to make a top notch cup of tea, coffee or hot chocolate. Tassimo has some of your favourite drinking brands, including Costa, Twinings, Cadbury and Carte Noire, so you can be sure your hot drinks are authentic, delicious and made just for you. The hassle free machines mean you just pop in a T-Disc, let the machine do its work and enjoy! Tassimo’s range of coffee T-Discs is a great way to get yourself going in the morning without fussing over a complicated coffee-making process. A Tassimo voucher code from vouchercloud could save you money on your next order, so you can stock up your machine with delicious coffee for less. Make your favourite Americano, Latte or Espresso and enjoy top quality coffee in your own home, at great value and with ease.